Tonight, the Academy of Canadian Cinema & Television presented the 32nd Annual Genie Awards ceremony in Toronto at the Westin Harbour Castle hotel. The event was hosted by CBC television personality George Stroumboulopoulos, who was solo after co-host Andrea Martin had to withdraw at the last minute. Although it did not win at the Academy Awards, Philippe Falardeau's Monsieur Lazhar triumphed at the Genie Awards. It won a total of six awards for Best Motion Picture, Director, Adapted Screenplay, Actor (Fellag), Supporting Actress (Sophie Nélisse) and Editing. A Dangerous Method was a close second with five awards. It won for Best Supporting Actor (Viggo Mortensen), Art Direction, Music, Overall Sound and Sound Editing. Cronenberg accepted the Music Genie on Howard Shore's behalf, saying, "Howard is in New Zealand working on The Hobbit. It's kind of a sequel to A Dangerous Method." 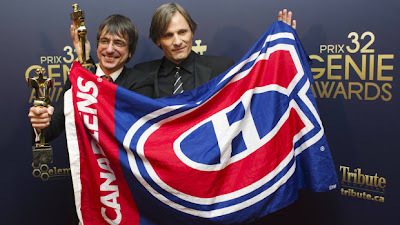 Mortensen joked that he would have to wrap his trophy in strong fabric to take it across the border and proceeded to wrap it in a large Montreal Canadiens flag. He dedicated his win to the team. Also a Canadiens fan, Stroumboulopoulos joked afterwards that sadly, that might have been the highlight of their season. Jean-Marc Vallée's Café de Flore had led with thirteen nominations. It won three Genie Awards for Best Actress (Vanessa Paradis), Makeup and Visual Effects. Starbuck also picked up three awards. It won for Best Original Screenplay, Original Song and the Golden Reel Award for the highest box office of the year. The previously announced winner for the Claude Jutra Award for a first-time filmmaker was Anne Émond for Nuit #1.